Trying to make the world a better place: (left to right) Skoll Award winners Gregory Rockson of mPharma, Nicola Galombik and Maryana Iskander of Harambee Youth Employment Accelerator, Nancy Lublin of Crisis Text Line, Bright Simons of mPedigree and Julie Cordua of Thorn. We asked some social entrepreneurs – people who've created projects to make the world a better place – to predict what they hope to accomplish in the not-too-distant future. They are tackling a range of daunting issues: child sexual abuse on the internet, youth unemployment, mental health crises, counterfeit drugs, lack of access to medicine. Some of them have founded nonprofit groups, others are hoping to make a profit as they do good. To get up and running, they've relied on a mix of government money, donations, grants, fees from companies that buy in. 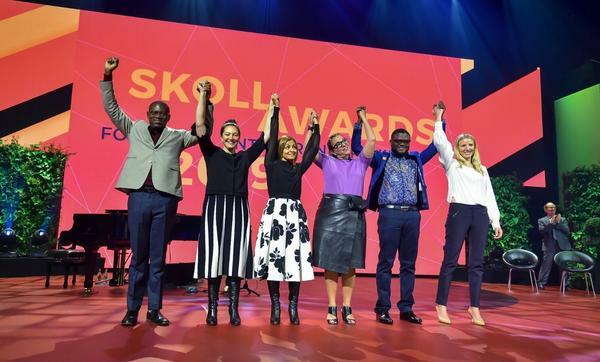 And this year they're each getting a $1.5 million investment in their work as the recipients of the Skoll Awards for Social Entrepreneurship, presented at the Skoll Foundation's World Forum this week in Oxford, England. Young, out of school and unemployed. That's a common situation in many countries, especially those with a bulging population of young people. In South Africa, for example, every year 1.1 million young people graduate from high school or college – or else they just drop out. But only 400,000 of them find a job. South African Nicola Galombik, who in her day job is director of a global investment group, wanted to found an organization that would do something about the other 700,000 – to help these kids stuck in "a no man's land," as she puts it. One problem, she says, is that potential employers can't easily judge an applicant's employability. A high school diploma doesn't attest to good English language skills, a strong work ethic, the ability to work well with colleagues and the public. The nonprofit group she started is called Harambee Youth Employment Accelerator. Harambee means "we all pull together" in Swahili. And she's pulled together a path for unemployed youth to burnish skills and land a job. Harambee invites young people to sign up for assessment and training. Their only expense is about one rand – about 75 cents — for mobile phone charges. They complete assessments and take classes to get them ready for the workplace. They're eligible for apprenticeships. Their reliability is judged as well as their skills. Signing up for classes and not showing up, for example, is a red flag. So in essence Harambee creates a talent pool for companies, focusing on such fields asthe service industry, retail, global business, digital firms and technical work. The program appeals to youth. Harambee works with half a million young people in South Africa and also in Rwanda. And it appeals to employers, who have offered 100,000 jobs to candidates from the Harambee pool. Prediction: By 2030 Galombik hopes that Harambee's efforts will grow, flipping the annual numbers in her country. She boldly predicts that of the 1.1 million youth leaving school each year, 700,000 will be able to enter the economy. If that happens, she says, "we've tilted the seesaw" in the right direction. When a person struggles with dark thoughts, mental health issues, abuse, one way to seek help is to call a helpline. But many helplines have limited hours. In some countries there aren't any. And it can be hard to reach out for help by phone if you're in school or in an office setting. Or if you're a kid and parents are hovering nearby. But you can easily text for help at any time and in practically any place, says New Yorker Nancy Lublin. That's what motivated her to found Crisis Text Line, which trains volunteers to respond to text inquiries and gives them support from staff with degrees in relevant fields. The group's data shows youth are big users: of the 100 million texts received in the first five and a half years, 75 percent are from people under age 25, and 13 percent of the texters are under age 13. Two-thirds of the texters say they're sharing something they've never told to anyone else before. Prediction: By 2030, Lublin believes that text-for-help will be available in 50 countries. And there will be real-time global data drawn from these texts so it's possible to see if, say, a suicide by a famous individual or a gun incident has triggered mental health crises in certain parts of the world. Such data does not exist now, according to Lublin. Even with this predicted progress, some things will never change. Lublin says that "mom" is one of the most popular terms in the texts and will no doubt continue to be – cited as a source of pain but also as a source of strength. You walk in a pharmacy to get some medication you need – say, for hypertension, for diabetes, for HIV, for malaria. They are all out. Or the pills are there but are prohibitively expensive. That's a common problem in African pharmacies, says Gregory Rockson of Ghana. Africa has many mom-and-pop stores that can't order in big quantities as chain pharmacies do. That means they may have to pay higher prices and may not be able to keep a full supply of medications on hand. The solution Rockson came up with is a company called mPharma(the m stands for mobile). mPharma can negotiate for lower prices because they're buying in large quantities. By monitoring data from the pharmacies, he can figure out what kind of supplies they need to keep on hand to meet customer needs. mPharma now works with over 200 pharmacies and 50 hospitals in Ghana, Kenya, Nigeria, Zambia and Zimbabwe. Prediction: By 2030 Rockson wants to see an Africa where companies like his private sector mPharma distribute drugs widely – and at a fair price — across the continent. Bright Simons of Ghana says his mother gave him the "Christian name" of Bright when he started religious school. It was a bright moment, a bright day, he says by way of explanation. Now Simons is living up to his name with an idea that shines light on counterfeit products. His company, mPedigree, gives consumers confidence that medicines and seeds they buy are the genuine article and not poor quality knockoffs. Fake pills and bad seeds are a serious problem in many parts of the world. Sometimes they're sold in fake packages that look like the real thing. People die from ingesting counterfeit medicines. Farmers see crops fail if they purchase poor quality seeds. mPedigree has created software to try and solve the problem – from digital tools for governments to confirm authenticity to programs that let brands track their products as they go from the source to the customer, who can then use mPedigree apps or hotlines for verification. These systems are now being used in 12 countries in Africa, the Middle East and South Asia. The company also certifies a range of other products, from cosmetics to auto parts. Prediction: Simons hopes to offer mPedigree's protections in many countries and for many products. As a side benefit, he says, consumers will develop trust in the marketplace – and technology as a tool to prevent fraud. It is illegal in the United States and most countries to post online images and videos of child sexual abuse. Yet across the internet, these images still appear on sites that let users put up content. The National Center For Missing And Exploited Children has reviewed over 267 million such images and videos. Some big players in the field – Facebook and Twitter, for example — take measures to find and remove this kind of illegal content. As for companies that don't — it's not necessarily that they are "bad actors," says social justice advocate Julie Cordua of California. Rather, they are "busy building their business" and don't have the ability to monitor all their content. Cordua is the CEO of Thorn, a group co-founded by actors Demi Moore and Ashton Kutcher. Thorn has developed software to help social media companies find the user-generated images and take them down and has also created software to assist law enforcement agencies as they try to find the children in abuse materials. They may be missing or victims of trafficking. In addition, Thorn uses online campaigns to target people who seek out abuse material and direct them to help. Cordua says the messages have "directed more than 100,000 individuals to seek help via confidential counseling" in the U.S. Prediction: "We will have eradicated the spread of child sexual abuse content online," says Cordua. "It'd be a good world if that happens." Editor's note: The Skoll World Forum is a funder of NPR.